Indiciative of the problems encountered attempting to run the Confederacy is that post war the former CSA members could never agree on when Confederate Memorial Day was to be observed. The Carolina's and Pennsylvania (not normally considered a southern state) chose May 10 for their observance, which not coincidently is the date of perhaps the second most revered Confederate General Thomas (Stonewall) Jackson's death. For anyone curious to learn more about the Civil War in laymen's language I recommend the Disunion blog on the New York Times Opinionator page. It was around 9 p.m. on May 2, 1863, during what would later be known as the Battle of Chancellorsville in central Virginia. Gen. Thomas J. “Stonewall” Jackson, with a few aides, was in front of Confederate lines scouting the federal position. The day had been a horrible one; Jackson, a senior general under Robert E. Lee, had attacked the Union’s right flank, demolishing the XI Corps. But the Union troops regrouped and counterattacked, and night fell on a confusing, bloody scene. Thousands were dead; thousands more would die in the coming days. Jackson had decided to venture forth to see the damage and plan for the next day. Suddenly there was a shot; then a volley. They came from the 18th North Carolina Regiment, who mistook the general and his party for Union cavalry. But the chaos continued. “Who gave that order?” replied Major John D. Barry of the 18th. “It’s a lie! Pour it into them, boys!” The North Carolinians obeyed with another volley. Jackson was hit three times. His horse bolted again. This time it could be stopped only by two of his aides. Jackson could not. His arm was broken. A musket ball had broken two bones in his right hand; a second bullet hit the left forearm. The third wound was the most dire: the bullet struck him about three inches below the left shoulder, severing the artery and breaking the bone. Jackson, nearly fainting, was helped from his horse. His aides supported him as he staggered into the woods to lie down. They gave him a little whiskey, which the teetotaling general resisted before drinking. Then they applied a tourniquet to stop the bleeding. A federal attack seemed imminent. The general had to be moved. The officers tried to walk him back to Confederate lines, but it became obvious that he was too weak. They placed him on a stretcher, just as Union artillery opened fire. Canister and grapeshot ripped through the woods and struck sparks on the road. One of the stretcher-bearers fell, wounded in both arms. An officer caught the handle of the stretcher just in time; Jackson did not fall. The firing continued. The soldiers lay around Jackson, shielding him with their bodies. Shortly thereafter, still under fire, they again tried to help the wounded general walk. Again he was too weak. They returned him to the litter. They had not gone far before one of the bearers tripped. This time Jackson fell. He groaned in pain. McGuire administered whiskey and morphine, and rode with Jackson in the ambulance to a field hospital some four miles away. There, Jackson was stabilized in a hospital tent. A team of doctors assembled. Chloroform would be administered, McGuire told Jackson around 2 a.m. His wounds would be examined. Amputation was probable. Did the general consent? The anesthetic took effect. “What an infinite blessing!” said Jackson. He repeated the last word “Blessing … blessing …” as he drifted off. The musket ball was removed from his right hand; then his left arm was amputated. Afterward, Jackson seemed to be doing well. He ate and drank and talked to visitors about military matters and theology. 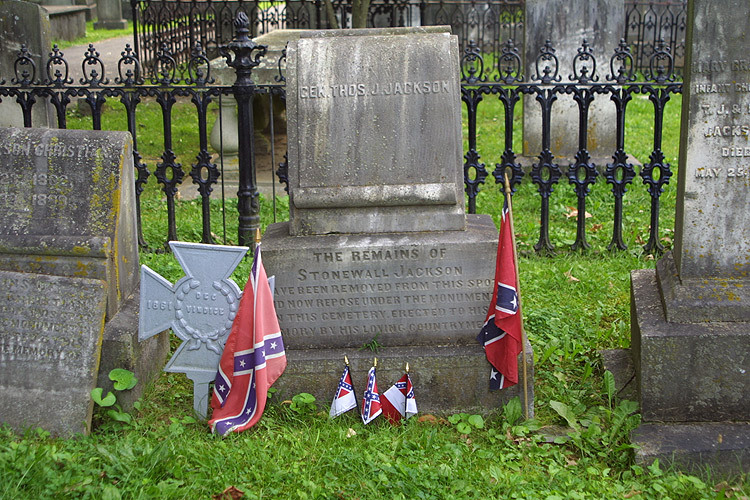 He also sent Morrison to Richmond to bring Anna — Jackson’s wife and Morrison’s sister — to be with him as he convalesced. One puzzling and disturbing episode: a pain in his side. Jackson told McGuire he had injured it during his fall from the litter the night before. McGuire examined him and found nothing. Meanwhile, the Battle of Chancellorsville continued; May 3 was the second-bloodiest day of the war. Robert E. Lee feared the hospital would be overrun. He sent word for Jackson to be moved, suggesting Guinea Station, some 27 miles east and south on the Richmond, Fredericksburg and Potomac Railroad. From there, Jackson could easily be evacuated further south if necessary. At Guinea Station Jackson seemed to be recovering. He settled into the plantation office of “Fairfield,” the home of the plantation owner Thomas Chandler, and slept well the first night. McGuire was optimistic. He was also vigilant, strictly limiting the number of visitors and watching through the night while Jackson slept. Jackson’s chaplain, the Rev. Beverly Tucker Lacy, arrived the next day. He held a bedside prayer service, which deeply gratified the profoundly religious Jackson. Lacy later took Jackson’s amputated arm to Ellwood, his brother’s nearby home, and buried it in the family cemetery, and returned the next morning for another prayer service. That evening, thinking that Jackson’s recovery was underway, McGuire allowed himself to sleep on the couch in the sickroom. Jackson awoke with nausea around 1 a.m. He directed his body servant, Jim Lewis, to wet a towel with cold water and place it on the painful area on his side. Lewis wanted to wake McGuire. Jackson refused, knowing how much sleep the doctor had lost the last few nights. The hydrotherapy continued until dawn, with Jackson’s pain increasing. When McGuire awoke and examined his patient, he diagnosed pneumonia, certainly resulting from his fall from the litter the night he was wounded. Mrs. Jackson arrived with their infant daughter as the crisis was unfolding. She seemed to sense the prognosis immediately. More doctors arrived. There were consultations, prayers and hymns. Jackson sank into delirium, talking as though he were still commanding his troops. Then he would rally, talking to his wife and playing with his daughter. “Little comforter,” he called her, still insisting to those around him that he would recover. He was relieved to learn that Lee had won the field at Chancellorsville, though at an almost incomprehensible cost of 13,000 casualties, against the Union’s 17,000. McGuire answered in the affirmative. He tried to comfort his wife. After he died, he said, she should return to live with her father, who was “kind and good.” They discussed his wish to be buried in Lexington, Va., near where they had lived when he taught at the Virginia Military Institute. I greatly appreciate you remembering Confederate history. One of my ancestors was a lieutenant under General Forrest. I live near Memphis, TN. and in the past year revisionist have changed the names of our Confederate parks. So fitting that you left this post up through today, Armed Services Day. Even though it's mighty windy here today, we're flying our flag! Hope you and your bride are well. So very sad. Thank you for this post. xo, N.G. Sir, we think once you change out that header photo, all those unwritten stories bottled on top of your desk will spill out onto ours. Also, wanted to let you know the remodelista.com show-it-off contest has been launched with couple of weeks left to submit entries. I still think those before/after photos of your bookcase project merit consideration for submission. We'll just imagine you wearing your straw hat today, come to think of it, you never showed us your loot from the NOLA trip. Happy 4th to you and Mrs. T! Toad, I've been thinking about you a lot and wondering if you're OK. Just a note to say you are missed and hope that all is well with you. A little sabbatical now and again is refreshing but now you're starting to worry me with your long absence. A quick "I'm fine." post would be appreciated, Toad. Missing you. Hello to Mra. T and your little ragamuffin dawgs. I hope all is well at Toad Hall. I miss you. Please let your readers know that you are hail and hearty. Be well. Could Toad be on a two-wheeled holiday? Barbara, you're onto something, yeah. Thank you, -F, for the tip. Toad's Tumblr is great! Oh lord I hate Tumblr:(. But for Toad and Max I suppose I must wend my way over there. The Laird is coming up on his 6th blogging Anniversary. [Six years putting up with us!] After giving us 6 years of his life, seems like we own HIM rather than the other way around! We're watching the calendar Sir, prepare for fireworks come Anniversary Day! Will Toad return in the merry month of May? It's been a year and I'm still checking here...at least the tumblr pics are pretty! I miss Toad's voice. Toad? Toad? I miss your posts.